Urban trail planning generally begins with a line drawn on a map. Sometimes the line evolves into something we can see and touch and experience, such as an active transportation trail. When that happens, it becomes meaningful for citizens who live in those communities. It also becomes rewarding for the planners who embraced a vision and designed a concept to help bring something great to life. Walkable development has played an increasing role in master-planned cities and communities—especially over the last two decades. It fulfills that desire to walk, run or bike to area shopping centers, schools, parks, neighborhoods and transit without getting into a car. The North Central Texas Council of Government’s Mobility 2045 plan, which adopted several municipal policies for bicycle accommodation as a form of transportation, was approved in June 2018. It outlines how the North Texas Active Transportation Network—within a 12-county region—calls for 96 percent of the population to live within a half mile of a trail network and bicycle facility by 2040. Today, 69 percent of the population lives within a half mile of these facilities. Evolving mobility options are critical for growing areas such as North Central Texas. Mobility 2045 also recommends that the regional Veloweb, which is an interconnected trail network spanning the Dallas/Fort Worth Metroplex, be expanded to more than 1,800 miles. Halff has been working with cities and counties on development of the Veloweb since the early 1990s. Reid Ewing and Otto Clemente help define these walkable/ridden spaces in their book, Measuring Urban Design: Metrics for Livable Places. Ewing, a professor of City and Metropolitan Planning at the University of Utah, and Clemente, a senior transportation planner, outline five key perceptual qualities that influence people’s decisions to walk or ride rather than drive. The term “sense of place” is often used to describe the emotion or perception created by the physical surroundings. Walkable environments that have been designed and executed well leave a profound sense of place and improve one’s quality of life. 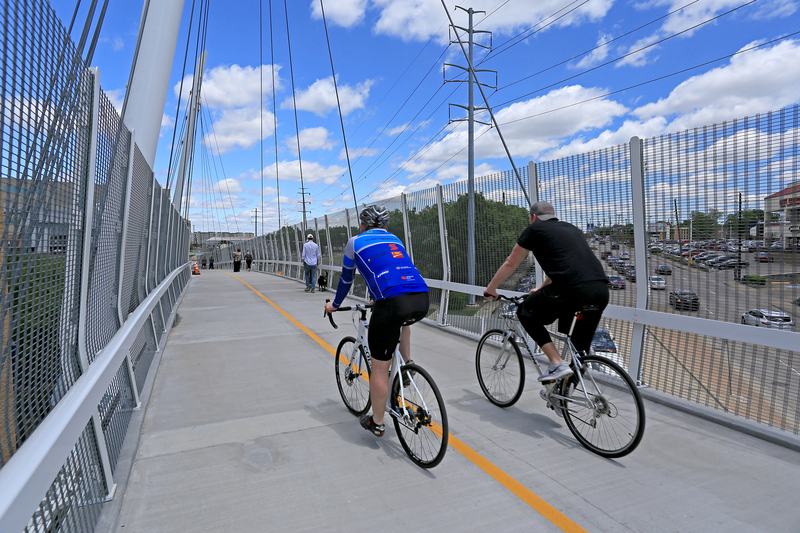 A pedestrian bridge, which connects the Katy Trail to Ridgewood Trail in Dallas, allows walkers and bike riders to cross busy Mockingbird Lane (Shutterstock.com). One great example is the Katy Trail through the City of Dallas. A 3.5-mile abandoned segment of the Missouri-Kansas-Texas Railroad was transformed into an irreplaceable Dallas treasure when construction began in 2000. Today it’s as popular as ever, as Friends of the Katy Trail—using people counters to monitor traffic—says two trail entrances surpassed 1 million users in 2017. That accounts for walkers and runners only. More than 3,000 people pass through the middle section of the trail per day, according to the Dallas Park and Recreation Department. Fitness and recreation: People who live or work near the Katy Trail can easily incorporate physical activity into their daily routines. They don’t have to seek out a gym. Connectivity: From Knox Street’s mixed-use urban center to the Victory area of Dallas, the trail incorporates multiple entrance plazas and access points that ultimately guide users to city parks, work centers, retail spaces, restaurants, entertainment venues, art, other trail connections and light-rail stations. Economic development: Hundreds of millions of dollars of new investment are being poured into areas around the Katy Trail. An HR&A Advisors Economic Value of Dallas Parks Study released in 2016 found that urban trails such as the Katy generate the highest return on investment of any Dallas park typology: more than 50:1 in the last 18 years. Why? Recreational connectivity, which results “in a price premium for homes adjacent to or within a short walk of the trails,” the study said. Also, linear parks (trails) touch more properties per acre than other type of park. Nature: Nature is a destination, and people actively seek opportunities to see wilderness and wildlife. Researchers of all kinds have pointed to evidence showing how nature has mental and physical health benefits for us. Whether for recreation or transportation, the Katy Trail delivers benefits to all users. Transportation: Traffic in Dallas, like any other major U.S. city, can be cumbersome at any hour of the day. 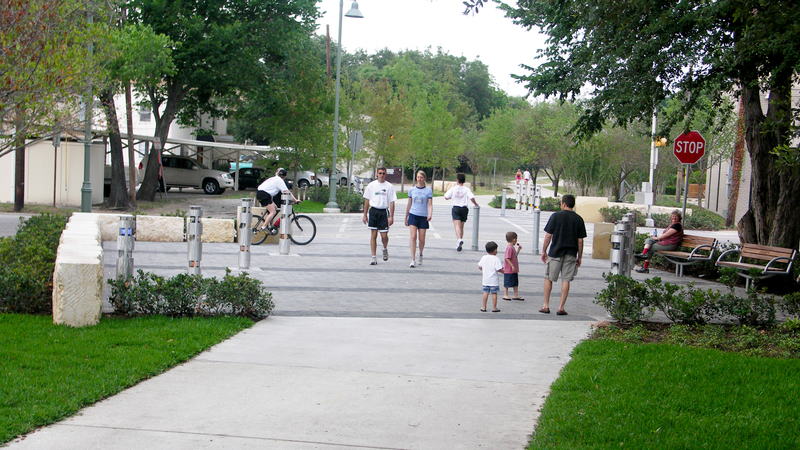 Walkable development may provide a more pleasing commute by foot or bicycle that incorporates nature and exercise. Plus, it reduces air pollution. Amenities: The Katy Trail, and many other great trails, offer elements such as benches, water fountains, kiosks, trash cans, lighting, public art, wayfinding, streetscapes, bike racks, bridges and parking to create a more bike and pedestrian-friendly environment. Again, it’s that sense of place and usefulness that make walkable development features so inviting—and influence someone to make a return trip. 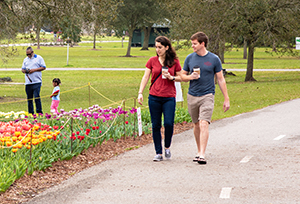 Whether benefiting the economy of a city, creating quality of place or providing a mode of transportation—rain or shine—walkable development truly sets us on a path to progress. The Waco Riverwalk along the Brazos River connects several downtown attractions. For more information write to Halff’s Planning and Landscape Architecture team at Info-Landscape@Halff.com.